Liverpool have a number of transfer targets that aren’t necessarily considered vital in January, but might be purchased further down the line. 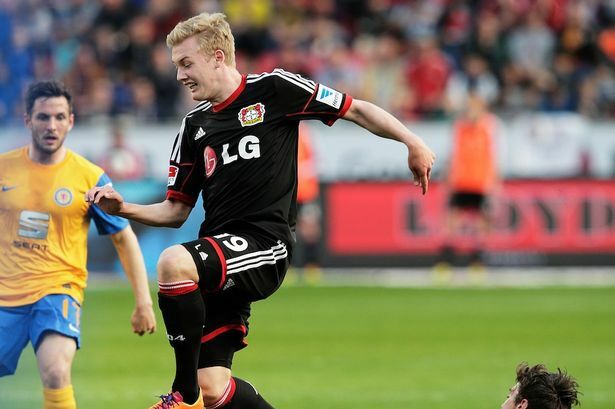 Christian Pulisic and Mahmoud Dahoud sit in this category and according to Melissa Reddy in Goal, so does Julian Brandt, Bayer Leverkusen’s 20-year-old inside forward. She suggests that Brandt is ‘one of the candidates’ under consideration if Jurgen Klopp decides to buy a winger in January, but that there’s no definitive plan to target a replacement for Sadio Mane – who’ll be absent for a month due to the African Cup of Nations. The likes of Quincy Promes (Echo) has also been linked, but if Klopp finds a replacement within the squad, he’ll prefer to stay out of the market. For example, he could use Gini Wijnaldum on the right, or switch Adam Lallana to the role, or deploy Daniel Sturridge or Divock Origi and move Roberto Firmino wide. Sheyi Ojo is also approaching fitness. Brandt is an exciting talent though, made more attainable due to the fact he has a £17m release-clause which comes active in 2018. He’s notched 17 goals and registered ten assists in 42 Bundesliga starts and suits Liverpool because of his versatility across a front-three and his preference for counter-attacking football. This January he’d likely be quite expensive, but the fact we’re monitoring Brandt so closely suggests we might bid next summer instead.